Junius Brutus Stearns 1856 painting of George Washington presiding at the 1787 Constitutional Convention. Coincidental to today’s celebration of Constitution Day, I began reading for the first time the Charles Beard 1913 classic, An economic interpretation of the United States Constitution. As with any topic of history, one pursuit becomes many, such is the case with my belated study of Beard’s groundbreaking work. Likewise, any such topic involves events that did not happen in a vacuum. Of course I soon broke out my well-worn text from my pair of Constitutional Law classes I took while an undergraduate and re-read the U.S. Constitution. As I continued to read more of Beard’s book, it soon became inevitable that I re-read The Federalist Papers, the collection of arguments put forth, anonymously at first, by James Madison, Alexander Hamilton and John Jay who hoped to persuade the state legislatures to ratify the newly drafted Constitution. There are 85 articles in the collection, but without a recent study of these, my reading of Beard would be much less informed – if not lazy – were I to skip over The Federalist. Finally, my once simple project now demands that I read the more contemporary refutation of Beard, the 1958 We the People – The Economic Origins of the Constitution written by Forrest McDonald. I stopped by my local library branch to collect this book only last night and haven’t opened the cover, an understandable delay given my growing reading load. Should I stumble upon another relevant source, it will simply have to wait. Of course my sub-heading is mischievous. This day, however, will be used to forward every political agenda under the sun, all citing the U.S. Constitution as the source for even the most rigid ideologies. Few will acknowledge the history behind the tedious drafting of the documents, the compromises and horse trading demanded for creating a document that stood a chance of ratification and the subsequent application of the Constitution by those who helped create it. 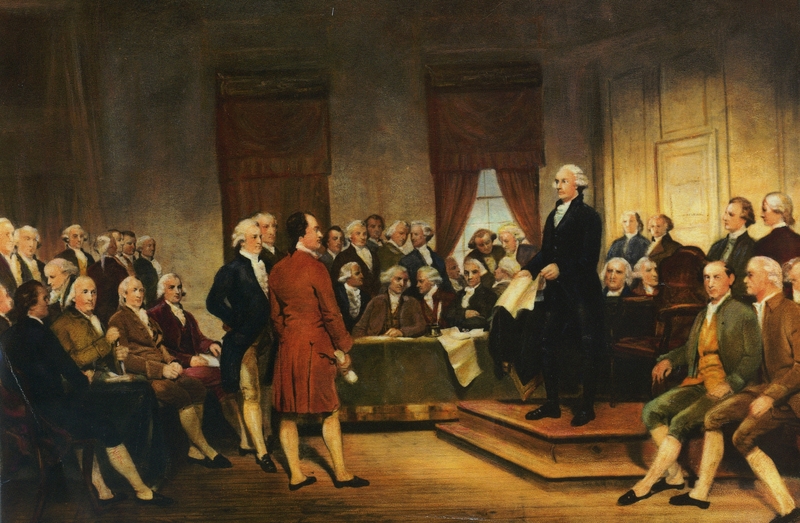 Many if not most of today’s commemorations of this 226th anniversary of the signing – not ratification – of the Constitution will be of a highly selective nature. Few will contemplate the inconvenient facts associated with our governing document and many will be simply phony. My suggestion for how best to honor our constitution is to remove the conditional appreciation of the document and reflect upon the real history. When presented to the Congress of the Confederation, the Constitution prompted a two day debate as to whether or not to censure the Constitutional Convention delegates for exceeding their authority. Vermont would not ratify the Constitution until January of 1791. Patrick Henry was a staunch opponent of ratification as were many farmers. Though the extend of influence Shay’s Rebellion had on shaping the specific articles of the Constitution is debatable, the failings of the Articles of Confederation clearly drove the effort to create the vastly different form of government outlined in the Constitution. None of the delegates, (signers), of the Constitutional Convention were farmers. The Constitution was not created in a vacuum and reflected the contemporary problems of the times. The end of the Revolutionary War brought a devastating recession, animosity by European allies to whom Americans owed great debt and were economically dependent upon as trading partners. Economic inequalities led to armed revolt in a growing number of rural areas. In short, our Constitution was not roundly celebrated by all citizens at its inception. Today, however, is a day for reflection more so than celebration, though a document surviving with only 27 changes in over two-hundred years is certainly worthy of toast or two. Still, knowing what it is you’re celebrating should require some knowledge of, in this case, the complex document with an even more complex history.